Terry Moore’s run on Runaways has been, so far, mediocre at best. The plots have been lackluster and overly-contrived, the humour has been repetitive, and the art in the first six issues was fairly terrible. But Moore has has one thing going for him, and in this series that one thing is a cornerstone: characterization. 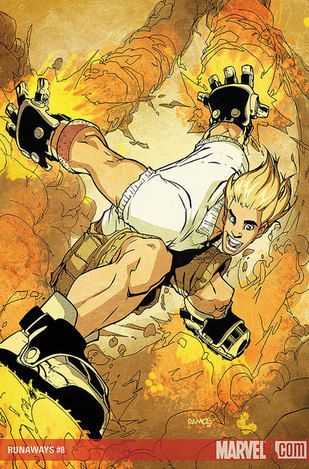 The Runaways have arguably gained much of their success from the fact Brian K. Vaughan and Adrian Alphona created such well-rounded characters with so much depth. One could also argue for the series’ wonderful relationship with the cliches in super hero comics, but Moore has much more grasp of the former over the latter. This is proven through the first few pages of the book. Just like the last issue, Moore allows the Runaways some downtime, which really lets his grasp of the characters shine through. Their funny and, well, normal kids, and watching them do that is very entertaining. Molly, the youngest of them all, taking charge and ordering Nico to turn off her book, Kara, the girl from the past, beating the android Victor at video games, these sorts of mundane scenarios are really the core of this run right now. So for Moore to continue to give those scenarios is a very good thing for the overall entertainment level of the issues. This series is one of the few in the super hero genre which could survive an entire arc of the cast sitting around interacting with each other. Unfortunately, this arc is not the arc of sitting around, this is the arc involving plastic surgery zombies destroying L.A. Also unfortunately, this is the place for the overused “L.A is the world’s most shallow city” jokes, which seem to pop up on everywhere. There are a ton of beauty and ugly jokes in this issue, to the point of serious overdoing. So, this issue really doesn’t deviate from the problems its had before, but continues to do what it does right even better, or for at least a longer time. It’s good, not great, but still entertaining. And to have Takeshi Miyazawa back to draw the Runaways again is fantastic. Miyazawa did some issues back in the days when the series was still written by Brian K. Vaughan, and having him back is a great experience. His art is expressive, clear, bright, and very accommodating to the series’ tone and style. Besides his tendency to make Chase look very feminine, I’m really enjoying the fun he seems to be having. Probably one of my favourite panels involves Nico’s staff of one emerging from her body and smacking a zombie square in the eye with a resounding “smack!” Also, all the sketches of the costume ideas Molly has are wonderful, with costumes designed with extra pockets, which makes the thing look like a parka, and many other ideas. Miyazawa’s having a good time, and that certainly translates for the reader. 7.5/10 Consistently okay, but still worth reading.